Aria, Hanna, Emily and Spencer struggle with whether or not to trust Alison in Pretty Little Liars Season 5 Episode 5, especially as she's about to return to school. Hanna doesn't want to be her puppet anymore, and Spencer doesn't understand why Alison won't be honest about her experiences. Emily is caught between Paige and Alison, while Aria still can't get over what she had to do to save Alison and her friends. Alison initially does a good job convincing the students of Rosewood (even Paige) that she's changed. She also tells Emily that the kisses they shared weren't just practice kisses. However, Mona confronts her and videotapes their nasty exchange in such a way as to make Alison look like the same viscous mean girl. Suddenly, no one trusts Alison anymore. As things between Emily and Alison get frosty, the police announce that they finally identified the body of the girl, right before A returns with a bang. 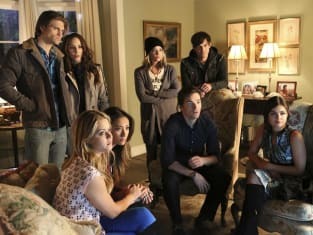 Watch Pretty Little Liars online to see who the mystery girl is.